Tafadzwa Mudambanuki addresses students at Marange High School. MUTARE, Zimbabwe (UMNS) -- Several hundred students, clad in green and blue uniforms, filled the assembly ground at Marange High School to hear one of their own tell them they can achieve their dreams through Christ. "Dream dreams!" alumnus Tafadzwa Mudambanuki told them during a June 26 visit. "Dream big for your life." Mudambanuki, 42, received an enthusiastic welcome to his alma mater. A staff member of United Methodist Communications, he was guiding a group of communicators on a photography and reporting field trip as part of a two-week training conference held at Africa University in Mutare. Set in the beautiful countryside of Manicaland Province, Marange High School is part of a United Methodist community that also includes a primary school, a sewing ministry and a fence-pole treatment program. 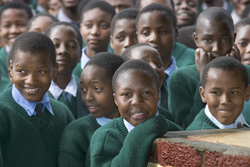 The high school alone has 832 students, most of them from Mutare but some from other parts of Zimbabwe. Mudambanuki and his busload of visitors caused a stir of excitement at the high school. Justine Goba, a teacher and deputy head of the school, warmed up the assembly. "The person I am going to introduce you to was once a student here," he said. "Woooo!" the students said, in high-pitched voices. "He graduated from this school in 1983," Goba continued. Students at Marange High School listen to a message from alum Tafadzwa Mudambanuki. In his speech, Mudambanuki emphasized the importance of following Jesus. When you are determined, disciplined and believe in Christ, you can do all things through him, he said. A number of times, he gave the first part of a biblical passage and the students finished the sentence for him: "I can do all things ..." he began. The students finished: "through Christ, who strengthens me." The son of peasant farmers in nearby Chipfatsura, Mudambanuki recounted how he was one of about 20 children at the Marange school when it reopened in 1980 following Zimbabwe's war for independence from Britain. Back then, the school used candles because it had no electricity, he said--a fact that impressed the students. During the holidays, when other students returned to their homes, he would stay behind to tend the school's chickens, take care of the grounds and made sure all the tanks had water in them. He was also the school prefect or student leader. "It was through this school I came to know God," says Chanzakupa Crispen Nyambawaro. After graduating in 1983, he did temporary teaching, then got a scholarship to a university in Sierra Leone, where he majored in geography and minored in English. Returning home to Zimbabwe, he taught at Murewa High School, eventually becoming headmaster of the school. He went on to receive advanced degrees in the United States in journalism, religious communications and information sciences, and joined United Methodist Communications in Nashville, Tenn., in 2004. He is co-coordinator of the Central Conference Communications Initiative, which is building communications resources for the church in Africa, Asia and parts of Europe. Mudambanuki used himself as an example of how the students could succeed in life. "If you're determined, you can do it," he said. "The sky's the limit." 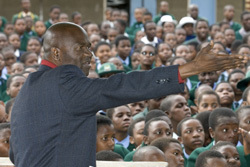 He warned the students against drugs; cautioned them about AIDS and told them not to let people put them down and tell them they come from poor families. "I hear great things about this school. I am so proud of this school," he said. "... What I am now, I owe it to this school." The students reacted with strong applause. After the speech, Comfort Unesu Hlahla, 16, said Mudambanuki's message was "inspiring." 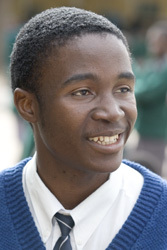 School captain Chanzakupa Crispen Nyambawaro, 19, said he plans on studying to be a doctor after he graduates this year. The school has had a big impact on him, he said. "It was through this school I came to know God." *Tanton is managing editor of United Methodist News Service. Tafadzwa Mudambanuki, UMCom: "It was overwhelming for me"